The Precious Stone trilogy by Kerstin Gier was originally published in German in 2009. The young adult, fantasy series was so popular, two years later it was translated and published in English, along with further worldwide publication. I confess that I was in part drawn to the lovely book covers as well as how many of my friends had read the series. The story centers on a London-based teenager named Gwyneth who learns that she comes from a line of time travelers and is lucky enough to also possess this gift, though her cousin does not. Her first time hop happens accidentally one day while she's not feeling well. She tells her best friend and is able to time travel a couple of more times before she tells her mother, in part because she's so startled by seeing her own doppelganger during the time leap. It is then that she learns the true circumstances of her birth, meets the members of The Lodge who act as guardians of time, and learns of what duties and adventures await her. [2 stars] When I started this book, it was a solid three or four stars: interesting premise, cool setting, curious problem. It felt, however, that the story lost its footing and trajectory when the protagonist's journey actually begins. Gwyneth is clumsy and has a rather funny personality. [3 stars] Funnier than the first. The novel includes a Cats-reenactment scene that is beyond ridiculous. That sounds weird out of context--and it is--but when you're reading it, it's funny but equally strange. [2 stars] Witty dialogue throughout the series, but the second installment is my favorite. 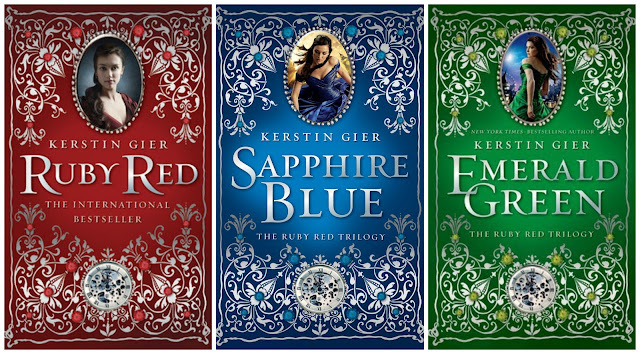 Have you read The Precious Stone Trilogy?